Well Berlin startup Versus IO is a comparison platform for just about anything in the world. Sure you may want to compare the iPhone 5 vs the Samsung Galaxy S 3, or the Galaxy Nexus vs the iPad Mini. But what if you wanted to compare other things? What if you wanted to take a European vacation and wanted to weigh France vs Italy. Well Versus IO allows you to do that comparison too. Versus IO added 240 cities to compare using their platform. Just go to their website here and enter each of the two cities you want to compare (as seen below) and voila, instant comparison. While the site is still in Beta the folks behind Versus IO plan on continuing expansion in to a wide range of verticals. Versus IO has been set up in such a way you should be able to compare just about anything. Adding comparisons for things like hotels, cars, airlines, department stores and other things people use everyday will definitely make Versus IO a goto site for information. Review sites like Yelp are great but with Versus IO you can get the comparison info and do your own research based on the things you’re looking for. The results screen is graphically rich but once you drill down you can see where each city met in terms of those criteria factors. For the comparison that we tried, Baltimore vs Caracas, we saw that Baltimore was “Pro” for 17 reasons and Caracas was “Pro” for 12. The comparison actually took milliseconds but the information returned was plentiful. 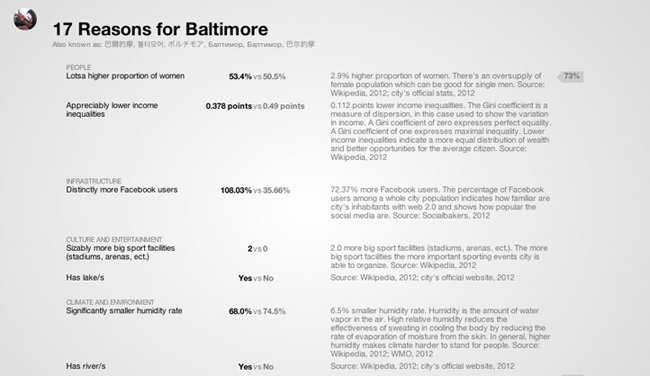 The top reason to choose Baltimore over Caracas was the higher proportion of women. Baltimore is 53.4% women where Caracas is only 50.5%. Versus IO also found that there are 72.37% more Facebook users in Baltimore than Caracas. Surprisingly, we found out that Caracas has more murders than Baltimore. Versus IO isn’t just a cute expansion on the hot or not concept, it does exactly what the founders say it does. Now that they’ve implemented cities and made a step away from traditional electronics comparisons they have plans to increase their comparison engine to 640 verticals. In the coming year Versus IO plans to add real estate, food, credit cards, TVs, banks, plastic surgeons and motorcycles.